This is the downloads section of the site. It holds all my Minecraft work including world downloads, craftscripts, or anything else I feel like sharing. This content is free to use, and include in your own work, but is not to be disributed by any means. That's it, enjoy. Important - Read before downloading! These downloads are distributed in the hopes that they will be useful, but WITHOUT ANY WARRANTY; without even the implied warranty of MERCHANTABILITY or FITNESS FOR A PARTICULAR PURPOSE. See the GNU General Public License for more details. This section contains all of the world downloads I have available for download. Note that some of them are older and may have to be updated to the anvil world format. This started as a simple custom terrain, but has now spawned into a highly detailed, full adventure map, with objectives, story line, and ending event. The whole project was actually inspired and designed around a picture I found that someone had posted to Deviantart. Check out the PMC update log for a full list of map features, and changes that have been made. I have updated the map again to fix some annoying bugs, make some improvements, and to keep it current, here are a few of the major ones. New custom biomes that match up to the island, and provide mob free areas. Fixed the low level fog/lighting issue by changing world type to flat. Updated almost all the main loot to new enchanted items and potions. Added some cave lapis luzi 'markers' to help in finding the portals. Clarified some of the objective and ruin text. 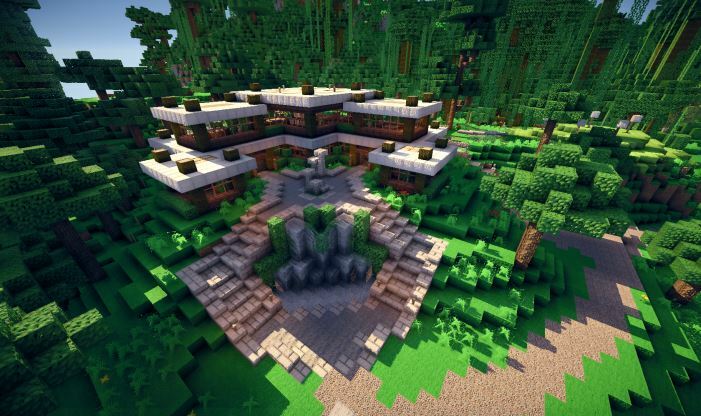 This was my first world ever, and my first attempt at making a house that was a little more pleasing to the eye and modern. The original design I used came from the picture included, although I decided to make it a little bit bigger and more complex than I initially was planning. Due to many requests over the last few months, I have finally updated this world. My original plan for this becoming an adventure map never quite came to fruition since my last update. However, since then, I have still added many new things to it since it is still by far my most popular map to date. A list of some of the changes can be found below. Also, I have used an old beta 1.3 copy of the game to get a brand new clean seed version of the map's changed areas for the people that want to create there own stuff, or just see want to see what it looked like before I started building on it. A new custom village has been added with a very unique sponge farm on the side. Another small village using the normal villager houses has been added. Many areas have been terraformed from the original terrain to be much better. New massive tree island and ravine added featuring lots of the new tree styles. Many villagers and animals added in to make the world feel more alive. Several areas around the beginning of the waterslide have been greatly improved. Many new trees from Build Commands have been added over most areas. Several updates to the Egyptian section to make it more complete. I put this project together after I was playing around with the worldedit mod the other day and found a way to easily make spiraling sections. I wanted to test the design on something and couldn't think of anything special right away so I ended up just going with a partially coiled snake. The whole snake was created with the worldedit mod alone while the desert background was made with worldpainter, I also used MCEdit to import it and the spawn section into the world. Since a few people requested it, I have also changed the snake so it is now completely hollow. The tunnel goes through the entire body from the open mouth to the base ground. There is now a tutorial video showing how this was made, and how to create your own custom spirals! This project is of a volcano right at the beginning of a large eruption. It is shown with streams of lava coming out all along the top and flowing down the sides. I used the worldpainter program to make the base island and volcano then created the remaining parts with the worldedit mod and MCEdit to align a few things easier. To get the lava to float in the air I just created it all with glowstone first then did a replace with MCEdit. This is a house I built a while ago that happens to be on a raised platform in the middle of the water. Like my other project, the main(outside) design of the house is based on a random picture I found while looking thru google images, which I have included. I have been playing with a lot of different design ideas on this one including trying to use a lot of hidden lighting elements with glowstone. I feel like I can finally call the house finished. I ended up spending a lot more time on the inside design than I planned, adding lots of detail over the whole thing. Private Office with large fish tank. These are all the maps and world downloads from my custom terrain series. The majority of them were made with the worldpainter software, with a few being created soley using Build Commands, or McEdit. This is another project made for my custom terrain series. This one features a large valley with lots of rainforest type trees spread all along the bottom, a large mangrove tree in the center, a huge waterfall in the corner, a massive cave system through all the surrounding mountains and lots more. I created the base terrain in the worldpainter program, spending most of the time trying to get the valley walls to look as realistic as possible. After the valley was all laid out I individually created around 20 different rainforest trees in another world save with the MCEdit forester script and saved each one into a schematic so I could hand place them into the valley. This world was one of my early worldpainter projects for my ongoing custom terrain series. This ones main feature is a broken mass of lots of pieces of land and floating islands that spread across the entire map. -Added 8 new custom biomes including new matching terrain materials. -All areas have been repopulated with new trees, and other resources. -Fixed low level lighting problem and updated to anvil world format. The whole project was created with the worldpainter program and MCEdit. I actually made all of the land using the worldpainter cavern tool. I then copied that over a solid resource map I created (not copying the air), so that all the caves would be filled with normal generated materials. After, I just replaced the material the cave "mold" map was made in to air, and I had the basic land formed. Grass topsoil, along with some trees and other items were also added in to make it look better. Hey all, I have another new, and completely unique map to add to my ever growing custom terrain series. This one also features a new treasure hunting element that will push your exploration skills to the edge! The whole objective of this map is to explore the island and find as much treasure as you can! 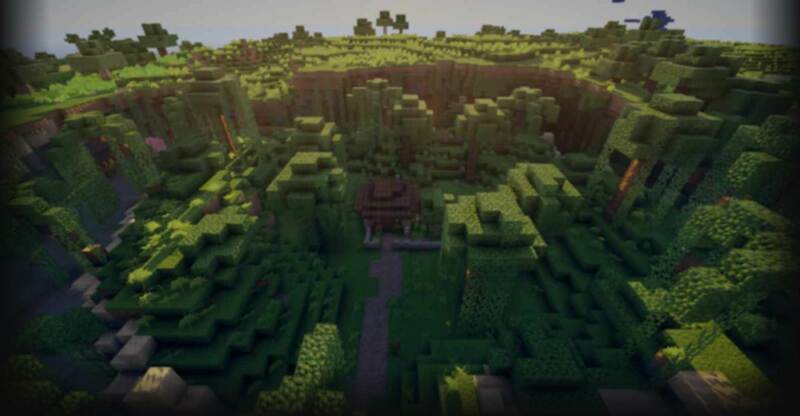 There are 50 small ruin locations to find, each containing completely unique loot, including several sets of enchanted armor, tools, and weapons, as well as enchanting tables and other helpful rewards. Finding all 50 will not be an easy task though, as the island has a lot of nooks and crannies left to be explored. if you do manage to find them all, send me a pm with some sort of reasonable proof and I will add your name to a special 'perfect score' section. Good luck, and have fun! Minecraft internal game mods section. This section contains all the WorldEdit craftscript I have created. They may be used on Singleplayer game mode with the SPC mod and WorldEdit, or on a Bukkit server with the WorldEdit plugin installed. Build Commands is my latest and greatest addition to my series of map making tools. It is a single worldedit craftscript that offers over 30 tools, and brushes not available in normal worldedit. Most of these tools are things I wished I had when I was working on my own maps. Some are from my older scripts, but a lot are brand new ideas I have just came up with recently. This script, and everything else you see here, has been created 100% by me alone over the past few months. If you enjoyed it at all, please consider showing me some support, either by giving a diamond on this mod, or liking the video. It really does help a lot, and encourages me to continue making new stuff like this. Thanks, and have fun! Majority of all commands work in both single, and multiplayer versions! Save, load, and perfectly place all new shape objects with a single click! Easy kit creation that allows loading up to 18 shapes with 1 command! Support for loading, and placing TerrainContol mod .bo2 objects! 10 new randomly generated tree types! Paint biomes ingame with a brand new biome brush! Easily create rivers and ravines with the advanced overlay brush! Fill and erode terrain away with my terraforming toolkit brushes! Mirror and flip your selection with greater ease and precision! Create a customizable flatland anywhere using the new flatten brush! Create custom 3d lines, laser beams, and massive spikes! Easily Place large patches of random ground foliage, or hanging vines! Rotate, and revolve your selection to any angle or increment! Save surface maps of your current area to an external png image file! Play the classic, windows puzzle game, Minesweeper, completely ingame! Hello all, I am really happy to present to you some very special craftscripts I have been working on! They are a collection of new tools and brushes for worldedit that will give you access to new building methods and techniques never before possible! It includes a total of 9 brushes and tools that cover many aspects of world terraforming and general map making. 9 new tools never before available in Worldedit! Worldedit based point and click editing, with undo! Designed to be easy to use, and completely customizable! Craftscripts will not break on new game updates! Erode - Custom terrain erosion and smoothing brush. Fill - Face based terrain filling and growth brush. Laser - Brush that fires a beam of destruction, or blocks to wherever you point. Vine - Smart custom vine/hanging blocks placement brush. Water - Smart water filling and random lily pad brush. Frag - Random fragmented, and optional hollow sphere material/pattern brush. Ellipse - Custom ellipse shaped material/pattern brush. Rect - Custom rectangle shaped material/pattern brush. Ore - Special randomized vein style ore generator with custom settings/blocks.